How to eat healthfully without sacrificing flavor (or dessert). The mission – to create a moist, delicious carrot cake with a light and tender texture. Gluten free, low carb, and sugar free of course. While avoiding the greasy, wet, denseness of carrot cakes past. I’m really pleased with how this one turned out, and so was everyone at the birthday party. It was just carroty enough and had a gentle amount of spice flavor. The cream-cheese frosting was really delicious as well, although the cake can stand on its own without it. This can be made as a sheet cake in one pan, if you need it to be more portable and easy to serve for a crowd. I made a layer cake, using two round cake pans, since the occasion was more celebratory and formal. Adjust oven rack to middle of oven and preheat oven to 350°. For a Layer Cake: Line two 9" diameter by 2" high cake pans with parchment paper. For a Sheet Cake: Grease one 9" x 13" rectangular baking pan with butter. Combine almond flour, coconut flour, baking powder, baking soda, cinnamon, nutmeg, cloves, allspice, and salt in a medium bowl. In a large bowl, beat eggs until well beaten. You may also use the paddle attachment and bowl of a standing mixer. Add xylitol, butter and milk and combine. Add flour mixture and combine. Add carrots. If using a standing mixer, continue to use the paddle attachment. If by hand, fold in with a rubber spatula, until the mixture is fully combined. Do not use a whisk or the carrots will get tangled in the whisk. Transfer batter to prepared pan(s), dividing evenly, and smooth surface. Bake until center of cake is firm to the touch, about 40-45 minutes. Let cakes cool completely before frosting, otherwise frosting will melt. Note: if making a layer cake, double the frosting recipe. Using a standing mixer with paddle, or a hand-held mixer, beat cream cheese, butter, vanilla, and xylitol on low speed until mixed. Increase speed to medium and beat until slightly fluffy, about 2-3 minutes. Scrape down sides of bowl as needed. For a Layer Cake: Invert 1 cake onto serving plate and carefully remove parchment paper if it stuck to the cake. Spread about 1/3 of the frosting evenly over cake. Invert 2nd cake onto a small un-rimmed baking sheet. Slide gently on top of 1st layer. Frost sides and top of cake with remaining frosting. For a Sheet Cake: Frost top of cake with all the frosting. So glad everyone liked them! Thanks for the tip on finely grating the carrots. How much is a stick of butter? How many grams? A stick of butter is 8 tablespoons or 113.4 grams. Good point. Here in the US sticks of butter are always the same size. I’m going to change the recipe to indicate the exact amount. Thanks. Hi, I am allergic to Almond so cannot use the almond flour – can I substitute the flour with only coconut flour or what else would you suggest please? What about the moisture content then? You can’t substitute coconut flour for the almond flour because coconut flour is very dense and soaks up an incredible amount of liquid. Assuming you’re not allergic to other nuts, you could try using a different nut flour like pecans or hazelnuts. Just make sure that it’s very finely ground (but not so fine that it starts to turn into nut butter). I haven’t tried doing it though so I’m not sure of the results. ps. my apologies for taking so long to answer this. I just saw your comment because there was a screw up with my web hosting service. what can I use instead of milk? You can use coconut milk instead of milk and coconut oil instead of butter. I just made it that way 3 days ago for a friend who can’t eat dairy. It was delicious! Are you allergic to all nuts or just almonds? not sure about calories, but you can substitute sunflower seed meal for almond meal. Best in cakes where the color won’t matter, since the color is a bit weird b/c of the seeds, but the taste is supposed to be perfectly fine. I’m going to give the sunflower seed meal a try and will let everyone know. Thanks very much for the suggestion! Hi! I made this yesterday for my husband’s birthday cake. I went with the 2 layers, and double the frosting (which I flavored with ginger and orange blossom essence). I’ve not tasted the cake yet, but will tonight. I can say– I think you’d need 2.5 times the frosting for the layer cake– I did just double, and it barely covered the cake and made the layer filling… 2.5 would give you some wiggle room and allow for more luscious “swirls” on the frosting. Also a question about the eggs– I looked up the conversion from medium to large eggs, but none of the converters went to EIGHT medium eggs! They said 7 was = to 6 large. I gave that a go, but think I might go for the 7th egg next time. I’ll report back with taste comments, but I’m sure it’s going to be delicious! Thanks for the frosting suggestion. Yes, 2.5 times would definitely give you more wiggle room. As far as the eggs – the reason I put “medium” eggs in the recipe is because we get eggs directly from a farm and they tend to be on the smaller side. You’re conversion to 6 large was right on. That’s exactly what I do when I have larger eggs. Thanks and I’m about to go and amend the recipe to large eggs since that’s what most people use. Looking forward to hearing how it tasted. Very good! I think, as with most LC baked goods, it gets better with time in the fridge. So we liked it the day I served it (day after it was baked and frosted), but the day after that was even better– the spices (I added a bit more, to our taste) came through even more. It kept beautifully in the fridge for 4-5 days (until we ate it all!) and had good carrot and spice flavor, and a great texture. Love the frosting too. I’m about to use the frosting recipe with your banana bread (cake) recipe, and combine with a chocolate cake, for my birthday cake. Will report back 🙂 Thanks and keep up the great recipe work! So glad it worked out for you! Thanks for letting me know. Any idea if this recipe would work if you substituted granulated erythritol for the xylitol? Also, approximately how many carbs per serving, and that would of course require specifying serving size or total number of servings. Yes, it would definitely work if you substitute erythritol for xylitol. I know because I’ve tried it. Sorry but I don’t have the nutritional info for my recipes. Looking into it but, at the moment, it takes time that I don’t really have. Thanks Lisa. I’m going to try this for Thanksgiving. Great! Let me know how it goes. My Fitness Pal calculated half a recipe with one cupcake serving as having 11.5 carbs per serving. Can you substitute erythritol for the xylitol? So sorry for the delayed reply. I usually get an email when someone leaves a comment, but for some reason I didn’t get notified and just saw this. It’s only been 3 months! Anyway…if you do read it…yes you can substitute erythritol. It works fine. I made this carrot cake a couple of weeks ago, and it was awesome! My very picky husband even LOVED it! I only made one layer (half the recipe), and it worked fine. It was moist and delicious. I substituted a little maple syrup for part of the xylitol in the cake, and subbed out part of the xylitol in the frosting for a tiny bit of liquid stevia. I also added almond extract to the frosting. The only reason I haven’t made it again is that I’m out of almond flour. Can’t wait to get some! Kudos to you for coming up with such a great recipe! Hi Kari, Really glad you enjoyed them! It’s so gratifying to hear that. Thank you for the vegan suggestions. I’m not familiar with substituting flax for eggs. How does that work? I was wondering if you can substitute pecan flour for almond flour? I also used 4 drops of liquid sucralose and 1/2 cup of product called “Just Like Sugar” (in has chicory root fiber, vitamin C, calcium & orange peel as the only ingredients) in the frosting because the xylitol crystals were so large. I feared they might make the frosting a bit chunky. It came out better than expected. I’m just waiting for the cake to come out. Thanks so much! Hope it came out well. I’ve used “Just Like Sugar” before and it works really well. Sounds delicious!! How many carbs in this recipe? I’m sorry but I haven’t calculated the carbs. Made this for my husband’s birthday today. He LOVES it.. and so do I! I’m so happy it worked out! Thank you for letting me know. This looks so delicious but I wish you had added the nutritional information at the end. I’m not set up to do that but there are a bunch of sites online where you enter each ingredient and it will calculate the nutritional info and then you just add it up. Thank you so much for taking the time to answer and give me this information. My 10 year old grand daughter was just diagnosed Type 1 Diabetic and I am looking for recipes. She loves Carrot Cake. I will check it out and hopefully will be able to make it for her. Thanks so much. My pleasure. What a good grandmother you are!! If you have time, please let me know how it goes. I have a question about the Xylitol. I buy it in bulk to make toothpaste with. I am just diving into baking with it!! (Totally late to that game!) Do you grind it to a powder, say in a Vitamix, before using it in recipes? So, the recipe is “1 1/4 cups powdered xylitol”? I am dying to get this question answered by other Bloggers. Thanks for any help!! There’s no need to grind it. I just use it as is. So the recipe is just 1 1/4 cups xylitol…straight out of the bag. Would love to hear how the recipe works out for you. 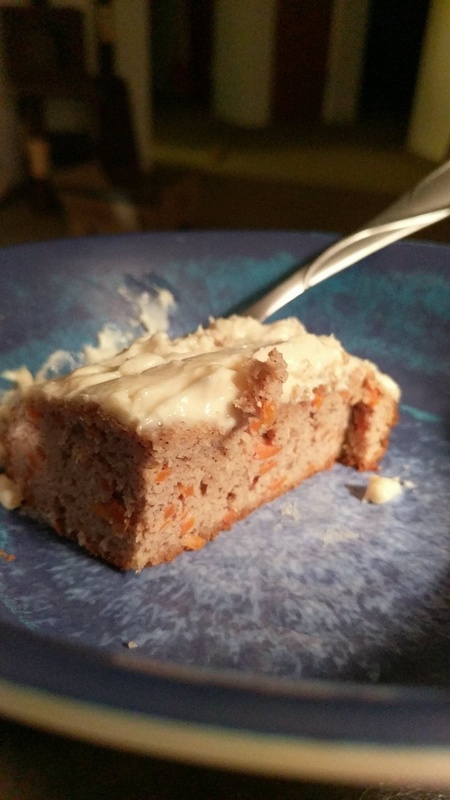 I wanted to eat cake for my boyfriend’s birthday and even though he is most definitely NOT low carb, he was more than happy to let me bake a cake we could BOTH eat (and carrot cake [was] my favorite cake). I don’t really bake too much, so I was completely stupid and DID NOT line my pans with parchment paper like you said to. What you would guess happened, they stuck to the bottom (even though I greased them!!!) and I got kinda discouraged because one of my cakes came out in two pieces and I had to pretty much “reassemble” it. I trudged on though and made the icing. I only made double the recipe and it was really more than enough to ice the entire cake, if I could have made more than double I would have had a lot of icing left over. I was able to assemble the cake and you can’t even tell the top layer had to be “glued” together! It is seriously good and my boyfriend said it was extremely delicious, he really did like it, and he can’t believe that I didn’t use any regular flour at all! This is the best and I have no doubt that if I made it for a co-worker or something, that they wouldn’t even know it was low carb. I was able to get 13 pieces so each piece came to 381 calories and 6g net carbs, which really for CAKE is negligible. Thanks so much for telling me your story about the cake. I’s so glad that it worked out for you and that you and your boyfriend liked it. Yes, I know what you mean about having to glue broken cake pieces together. Believe me…it’s happened to me many times. Happy Birthday to your boyfriend! Here are the macros for the recipe as written, incouding the allspice. Someone down below said they were able to get 48 cupcakes out of the recipe, but for that number you would probably need a double recipe of frosting. That would put a cupcake at 120 cals, 10.3g of fat, 3.9g of carbs, 1.5g of fiber and 2.9g of protein. I think it’s more likely you would make sheet cake out of this, using just a single recipe of frosting. You could easily cut a 13×9 cake into 24 pieces, leaving you with macros of 187 cals, 15.7g of fat, 7.4g of carbs, 3g of fiber, and 5.2g of protein. You could also swap out some of the carbs for more fat and calories by switching out the milk for 1 cup of heavy cream and 1/4 cup of water, or substitute it entirely for unsweetened coconut milk. That is so great that you took the time to figure that out and share it with everyone. Thank you so much!!! I know many people will appreciate your effort. I appreciated the macros from you Christopher. I don’t often reply but had to after making this recipe. This carrot cake is so amazing! I’ve been doing low carb/keto for a couple months now and have been experimenting with many different dessert recipes of which only a few have been worthy but this one is so worthy! Everyone loves it whether they follow keto or not. Everyone should definitely try this one…thank you for this!! I appreciated the macros, Christopher! Absolutely delicious, you would never know it was low carb! Will definitely be making again! Hi! 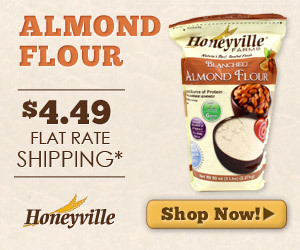 When you measure the almond and coconut flours do you pack them in the measuring cup or just scoop and level? This seems to make a big difference when baking grain-free. Thanks! HI, Sorry for the late reply. I was away. I measure the flours just scooped and leveled. Good question. How do you measure the almond and coconut flour? Packed or scooped then leveled? I’m going to try making this tomorrow! Do you think that I could use unsweetened vanilla almond milk as a milk substitute? Not sure if that would change anything. Thanks! I think almond milk should be fine. I’ve never tried it but I don’t see why it wouldn’t work. Maybe add only 1 cup instead of 1 1/4 cups, since it’s so much thinner than whole milk. If you want to go dairy free, a great alternative that I have tried is 1 1/4 cups coconut milk. Make sure the can is labelled coconut milk and isn’t the coconut water that’s so popular. Shake the can well before measuring. I just wanted to let you know that I made this cake for my dads birthday today and everyone loved it! This is the first low carb dessert I’ve had in months that actually tasted like dessert and not like artificial sweetener. The almond milk worked great – I ended up using the same amount as your recipe calls for since my coconut flour was really absorbent. Thanks so much for posting the recipe – can’t wait to try your other stuff! Thank you for letting us all know about the almond milk. That’s a good alternative! I’m sorry but I actually don’t know what the change would be for high altitude. I imagine the baking time would change. I suggest just keeping a close on on it as it cooks. Yes, you can definitely substitute buttermilk for regular. Can you taste the coconut? My Mom wants a carrot cake but dislikes anything coconut. Could you substitute something? Everything else about the recipe remains the same. Could I use Swerve instead of xylitol? Would the amount used be the same? Yes, you can definitely use Swerve instead of xylitol. The amount should be the same, but I would taste a bit of the batter as you add it, just to make sure. Thanks! Making this for my son’s birthday tomorrow–so glad I found your recipe! This. Cake. Was. Amazing. I just made this for Valentine’s Day and oh my GOD, it was better than normal Carrot Cake. I never comment on things, but I had to come here and THANK YOU for sharing this incredible recipe. By far, it is the best low-carb dessert I’ve made, and probably the best thing I’ve ever made period. We ate half the cake in one night; we couldn’t stop ourselves. I will be making this again and again. If you’re thinking about making this cake, do it. It’s to die for. Thank you so much. Your comment is the first thing I’ve read so far this morning. What a nice way to start my day! I’m really glad that you enjoyed it. Some of these posts are 3 years old but I still wanted to add my comments about this carrot cake. I made the layer cake and I believe I followed the recipe exactly. When I licked the batter spoon, I thought to myself, “oh boy I hope it bakes better than it taste raw cuz this will be a big waste of ingredients.” I am delighted to say that it did not let me down. Super moist, dense, and the perfect sweetness. I substituted the sugar with Monk Fruit sugar and added a touch of ginger sweetener to the frosting and BAM…this is my new favorite cake! Had to thank you and tell you how wonderful my entire family thinks it is. You had me worried there for a minute! So glad you and your family like it. Just to let you know people are still looking at this recipe. My daughter has Candida and her birthday is Friday so we are excited to make this! I know it will turn out wonderful based on all the other comments. You should add good for Candida Diets to guide others here. Thanks for figuring out such a great recipe! I have learned to make a lot of foods for her Candida diet, but always forget to write down the measurements, etc. so good for you! Thanks so much for calling that to my intention. I’m totally ignorant about Candida Diets. I’ll check that out and add the info so that other people who are looking for Candida Diets will know about it as you suggest. Iwish there was a carb count included, as it’s a low carb recipe. This was the only carrot cake I found on Pinterest that had the only ingredients my pregnant friend could have (she requested it for her baby shower). The specialty bakeries wanted $50-$70 and 3 weeks notice to so it, so I decided to take it on myself. I’ve never made carrot cake before or even baked with these flours and sweetener, but this was a triumph! So moist and delicious, not too sweet, but just right. The guests at the shower were taking extra pieces to go after already having a slice. The Mother-to-be LOVED it and many asked for the recipe. Thank you for sharing! That’s so great to hear! Thank you for letting me know. It really makes me feel good to know that I contributed something to your special occasion! Congratulations to your friend. I really wish I knew how many carbs. Are in this carrot cake. My daughter’s birthday is Thursday. I would love to make it. She wad recently diagnosed as a diabetic. Carbs. really make her numbers rise? I’m nervous about using the Xylitol. Can Stevia be used instead? Just Like Sugar (they make 2 types so get the Table Top one) is a blend of crystal chicory root that is 96% dietary fiber, mixed with calcium, vitamin C, and its sweetness comes from orange peel. Chicory root is high in sweet carbohydrate dietary fiber called inulin (not to be confused with insulin). Inulin is not digested in the human body, and does not metabolize as a carbohydrate. This means effectively that although it tastes sweet, it does not affect blood sugar levels. A word of warning – I don’t like the taste of stevia and Just Like Sugar has that same taste. It doesn’t bother most people though. Just Like Sugar is available at Whole Foods and online at JustLikeSugar.com, Vitacost.com, Netrition.com, etc. I also made it dairy free (except for the frosting) by substituting canned coconut milk for the dairy milk. It was great! I have Truvia Blend (Erythritol, Stevia, cane sugar) The conversion chart on the package is only for sugar. Have you tried this before and how much would I use to substitute for the xylitol? Thank you. I know this is an older recipe and the thread is dead, but i made this to a T (with your suggestion of doing 100% almond flour/meal) and the recipe came out way to wet. The batter was almost like thick chunky soup pouring into the pans I tried keeping it in the oven longer and longer and was not getting anywhere. Are the wet ingredients correct? I made this cake yesterday (as a sheet) and OHMYGOSH IT’S FANTASTIC!